A magical fable weaves together the lives of three people in Haiti, five years after a devastating earthquake in Haiti’s first official entry for Best Foreign Language Film at the Academy Awards. Three stories intertwine, collide and co-exist. A grieving teenager discovers he has a superpower; an old fisherman thinks the cure for his ailing wife can be found in the sea; and a muse struggles to exit the story her author is penning, in this magical neo-realist fable set in a coastal village Haiti, five years after a devastating earthquake. With stunning cinematography by Mike Morasky (The Matrix Reloaded, The Lord of the Rings: The Fellowship of the Ring, The Matrix Revolutions, Pirates of the Caribbean: Dead Man’s Chest), the film was shot entirely on location with local actors and crew. Felin’s film is an important addition to the body of work coming out of Haiti’s burgeoning film scene. 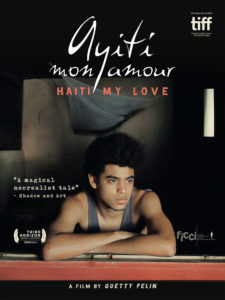 Ayiti Mon Amour doesn’t just mark the emergence of a distinct new directorial voice; it’s a key development in the evolution of a national cinema.